This was my first concert at the tender age of 16. The Eagles were the opening act and I remember liking the music. 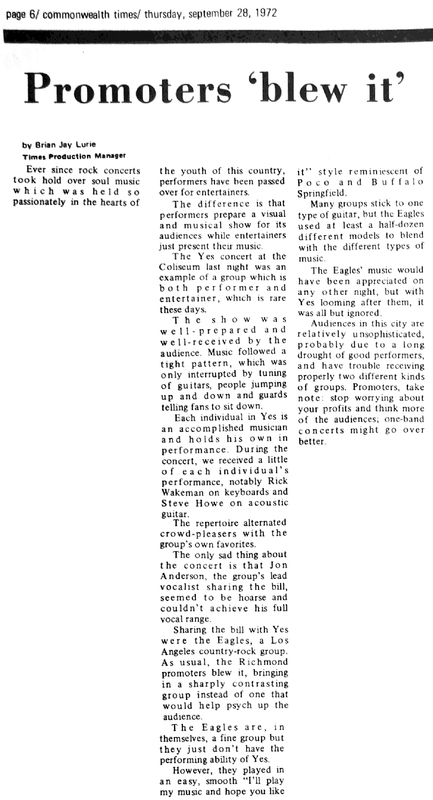 But Yes made such an impression that I have been a true Yesfan ever since. The giant mirrorball for the opening of Close to the Edge was something me and my friends thought was really "far out". 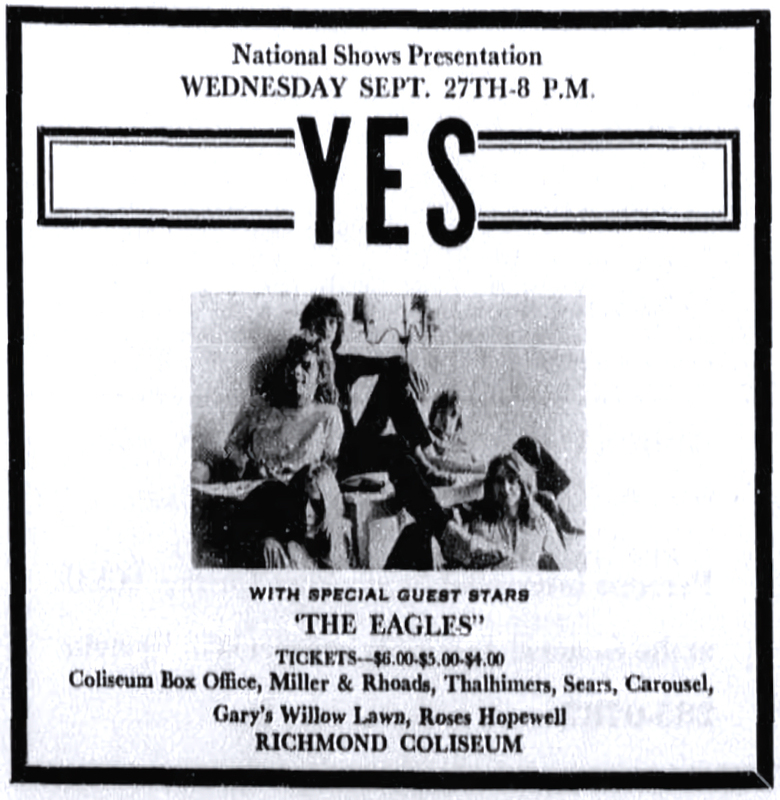 I saw Yes perform in the Richmond Coliseum in 1972 when I was 18 years old. They began by playing Siberian Katru, the last cut on the Close to the Edge album. This album had just barely been released at the time, and I had not heard it yet. I particularly remember hearing Chris' profound bass line in this opening song, which made them sound so distantly, classically "Yessish". Jon was dressed all in white, and talked about not being able to find a decent vegetarian restaurant in the area. Chris wore a kind of swashbuckler outfit, with huge, tall boots that came almost to his waist. And of course there was Rick with his sequined robe, which flashed and glittered in the spotlights, as he whirled around inside his massive collection of keyboards - a full size Steinway Grand, a Hammond B3, two Moogs, two Mellotrons, and a harpsichord. When the band began to play Close to the Edge, everything was dark, except for a single spot which shown on a mirror ball mounted at the top of the huge dome ceiling. The effect, accompanied by the swirling, chirping bird sounds, gave the amazing illusion of thousands of birds flying around and around the dome ceiling. Never hearing this epic musical piece before, needless to say, I was blown away. The band played Yours Is No Disgrace for an encore. By this time, I had come out of my seat and was on the floor, as close to the stage as I could get, like everyone else. This enabled me to fully hear the effect of the part where Steve plays his solo riff that switches back and forth between speakers. Like on the record, the sound system on the stage faithfully reproduced this effect, but it seemed to be intensified a thousand fold! I have seen Yes perform many times, but never saw a show that surpassed or even matched the intensity, excitement, and sheer joy that this one produced. Out of all the concerts I have been to, by any band, this was probably the best that I have ever experienced.